As a non-profit organization, Falcon understands the importance of giving. We have benefitted from the generosity of many people and organizations over the years and, in that spirit, we feel it’s important to help others as well. Falcon Theatre is involved with several community projects that promote the arts and the love of theatre. Holy Family, based in East Price Hill, serves as a courageous, faith-filled community reaching out in compassionate service to all races, cultures and ethnicities, creating a multi-cultural faith community. Prior to 2014, Holy Family didn’t have the luxury of offering a theatre program to its students. It was a great honor for Falcon to be asked to join them in helping build this creative outlet. Falcon thanks Holy Family for allowing us to be a part of this journey and congratulates them for the amazing success they’ve created. We’re so proud to be a small part of their inspiring story. In 2014, Holy Family produced their first play ever, the musical Cinderella Kids. Falcon offered guidance on producing their first show, and also provided technical support including microphones and sound support, lighting and backstage help. Many of the children in the show had never seen a play before much less been in one. It was a great experience for everyone to have the opportunity to work together on such an exciting project. This was the beginning of what would become a growing theater program at Holy Family and wonderful partnership with Falcon Theatre. In 2015 we joined Holy Family for their second production: Annie Kids. Again, Falcon had the opportunity to provide technical support for the show while working with these amazing kids. In 2016 Holy Family was ready for a more ambitious project, taking on The Lion King Jr. With all custom-made costumes and masks, this production was an enormous challenge which they met with flying colors. Falcon was there to support again with set construction as well as lights and sound to help complete this huge undertaking. 2017 took us “Under the Sea” with Holy Family’s production of The Little Mermaid Jr. In just 4 years, Holy Family’s theater program had grown into a fully fledged theatre program with dozens of students involved. They expanded their technical capabilities to be able to handle larger shows and the productions they’ve created have inspired members of the surrounding community to support major (and badly needed) renovations to their historic theater. 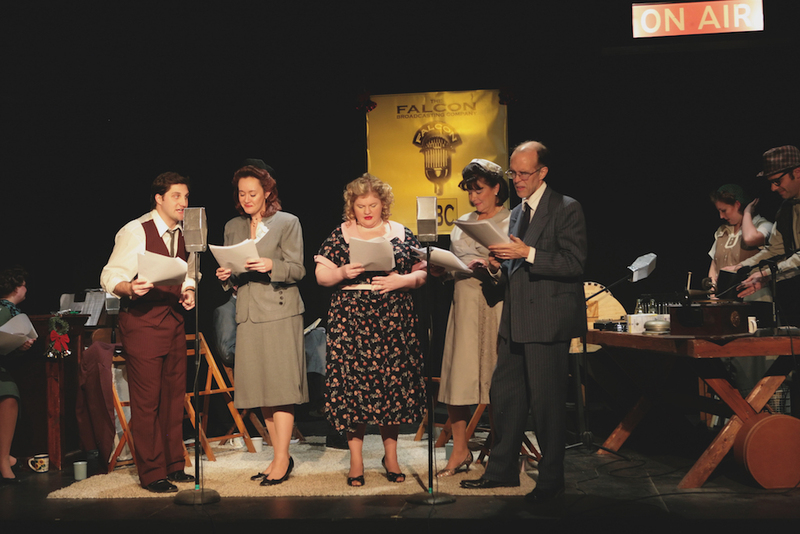 In 2008, Falcon’s production of It’s a Wonderful Life: A Live Radio Drama was recorded during a live performance and then aired on WRRS, a local radio station that provides content for the blind and visually impaired. The broadcast was awarded the 2009 IAAIS Program of the Year On Location award. As a staged radio drama, It’s A Wonderful Life provided the perfect opportunity for WRRS’s audience, who might not as fully enjoy theater in the traditional sense, to experience the magic of theater as it used to be…on the radio. Falcon was proud to be a part of this community project that brought theater into the homes of WRRS’s listeners.